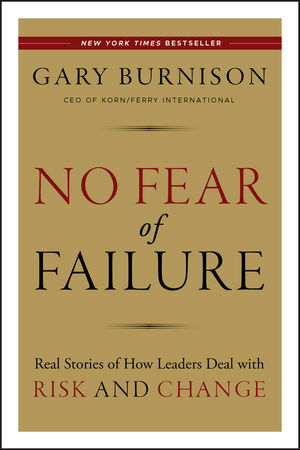 No Fear of Failure offers insightful, candid conversations with some of the world's top leaders in business, politics, education, and philanthropy—each giving a first-person account of how they approached crucial, career defining moments. Gary Burnison, CEO of Korn/Ferry International, the world's largest executive recruiting firm, sits down one-on-one with a highly select and elite corps, and together they openly discuss how they handled (often very publicly) war, economic downturn, corporate turnover, and even retirement. Together these world-class leaders show the risks one must be willing to take, as well as the vision, resilience, and compassion necessary to lead. Taking readers into executive suites, government offices, battlefields, and football fields, No Fear of Failure shows how great leaders make lasting impact. Gary Burnison is chief executive officer of Korn/Ferry International, the world's largest executive recruiting firm and a leading global provider of talent management solutions. He is also a member of the firm's board of directors. Burnison is a regular contributor to CNBC, CNN, and Fox Business, as well as to other international news outlets. He lives in Los Angeles with his wife, Leslie, and children.